To accompany the show NOHO ARTISTS, of new work by Fleur Deakin and Rod McIntosh, Crista Cloutier* has written an essay about each of the artists work. Below are some extracts from my text. The new artwork of Rod McIntosh is an exploration into pigment and surface. Yet at the same time, it moves beyond the surface both literally and conceptually. Like the pigments in the pieces themselves, every aspect of these works, from conception to preparation to creation goes deeper than what the viewer can see. A conversation is taking place here between the materials and the marks, between the intention and the physicality. 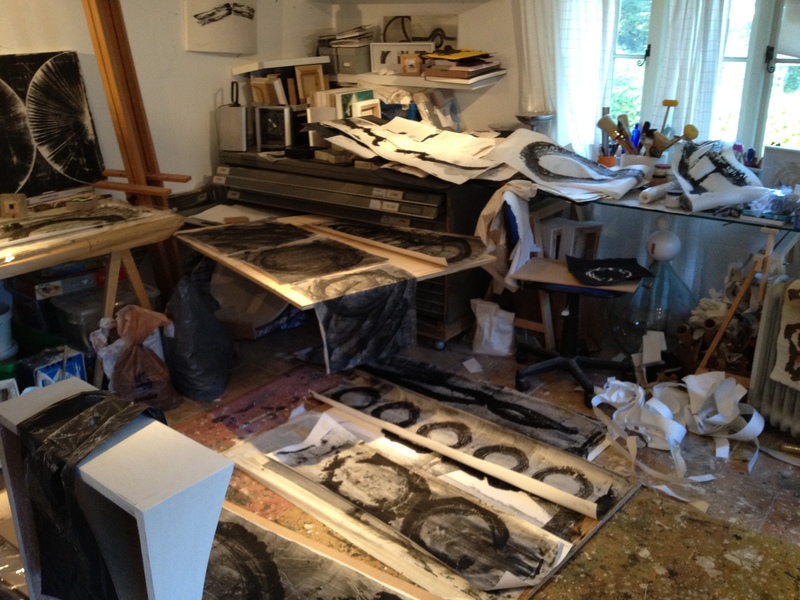 Materials came into play – charcoal, carbon, ink. It is a process driven practice, as he explores how each of these materials behaves. And out of this process has come intention and form. There is a bit of mad scientist in Rod. He is a sentient visual tactile learner, he likes to get his hands into things. He creates his own gesso and rice paste. He mixes his own inks. Going back to his roots in sculpture, it’s about authenticity, craftsmanship, and honesty in materials. The first thing one notes upon seeing the new work is the absence of colour. This is not just an aesthetic choice but part of the process. 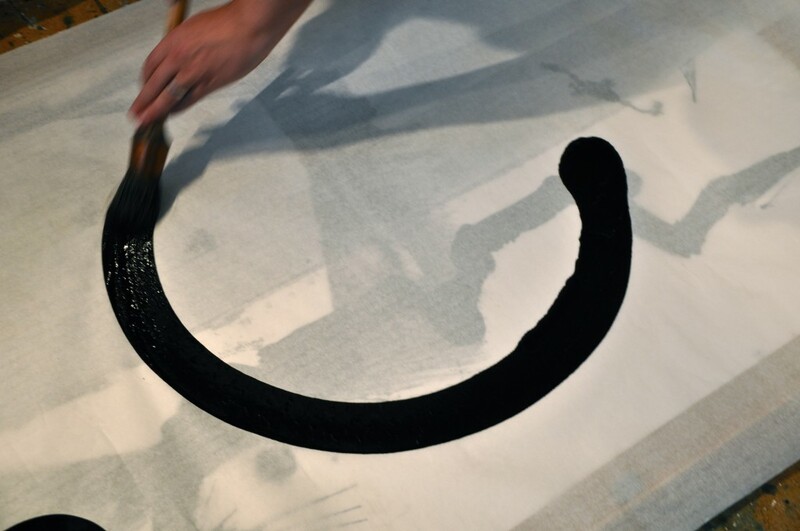 Working with black pigment is a practical constraint. It soaks into the work rather than sitting on top of the surface as coloured inks do. This allows him to apply it in layers, then sand it away only to layer again. 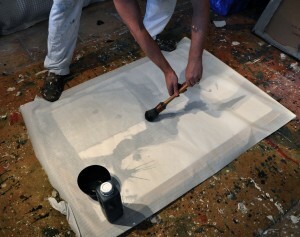 The pigment particles become trapped within the gesso. The ink has become part of the work itself. But there are great challenges in working with just one colour. How do you create different forces of energies when it is monotone? It comes through the mark. Rod’s mark making is minimalistic. It is not placed within a particular school or belief, but is self-referential and true. It has a physical resonance while being thoughtful and provoking. It is considered and practiced, and the starting point of where all his work comes from. The mark making itself is almost a sort of performance. 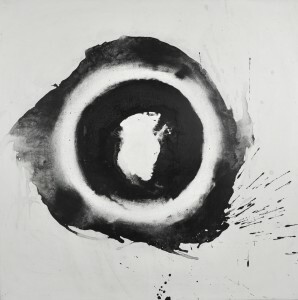 He now has a vocabulary of marks that recur in his work, circles, semi-circles, infinity swooshes, meditative brushstrokes. 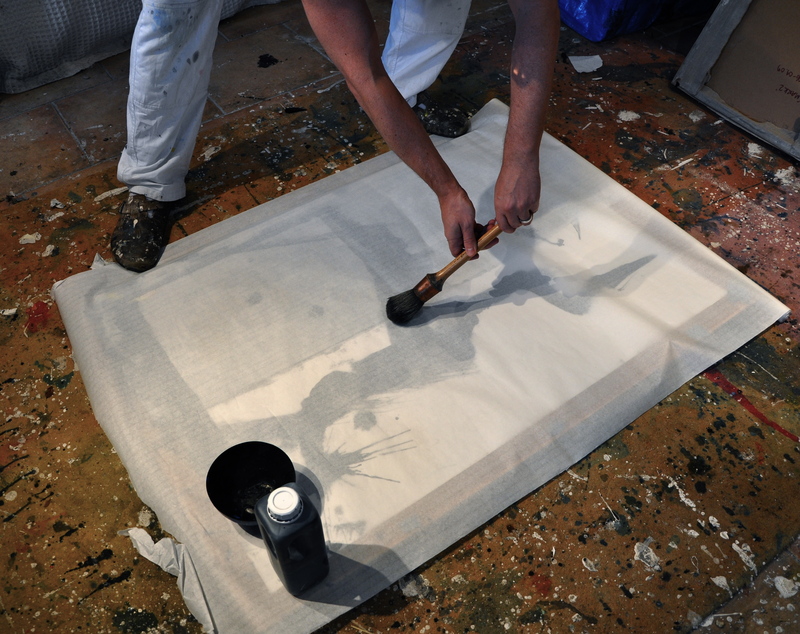 When he has decided on his brush and his mark, Rod rehearses it over and over again, exploring it through repetition, repeating the gesture he intends to use until it is ready to commit. There is something very Zen about this practice. Rod explains, “I work as hard as I can to prepare. Not just the surface, but in rehearsing for the mark. It is about revealing the process in a physical form. And when the time comes, it may not be perfect. But it will be my best. Because life has showed me that perfection can be tiring. Living with imperfections has liberated me.” The imperfections have become a part of perfection in this bold work. Rod says that making this work challenges him but at the same time it makes him happy and helps him to make sense of himself in the world. I would add that when we look at these pieces until we really see them, when we look beyond the surface, we are able share in this happiness and take away a little piece of Zen. *Crista Cloutier has been actively involved in the contemporary art world throughout her career, she works internationally as a writer, artist, playwright, and educator.